as you can see, tonight z and i went to pick up our african pygmy hedgehog from vickie + gary jester. we decided on hoggle for his name, so everyone say hello! i heard him crunching up some food a bit ago. he's had quite the night though. he was born on april 7th, for the record. expect lots of cute overload hedgie shots soon. seriously, he is doing so well. my tomato plants are a bit better. after pruning a bit last night and watering with cayenne peppered water things seem to be just a bit better than yesterday on that front. to make things even better today, jenny t. has moved back to chicago from seattle and she lives right down the street from me! i was going to go out with her and jamie g. tonight and i was all ready but then i took off my shoes and realized i just wanted to sit around here listening to hoggle chomp on food and run on his wheel. i'm totally head over heels in love, dudes, with both z and hoggle! OMG it's a friggin hedgehog!!!! There were three pets J and I considered... rat, hedgehog or dog. It's very cute. a lot of people have hedgehogs and another pet, so getting a hedgehog is not out of the question! i am pro-hedgehog for anyone who truly feels they have the patience to bond with it. hoggle has totally stolen my heart. all i want to do is hang around him all day. And I never got around to voting, but Hoggie is perfect. when he is nervous or scared it will hurt if you pick him up, but as he relaxes his quills won't dig into you anymore. he has a soft underbelly that is furry and white. do some research. they are fascinating little guys. 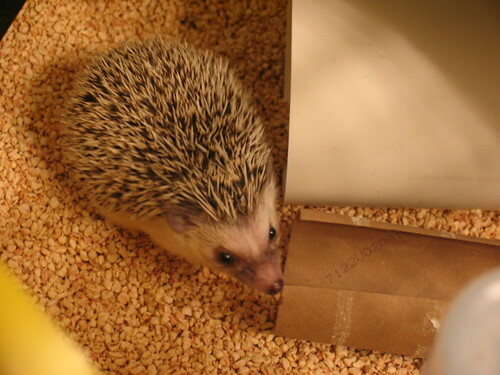 hedgehogs are insectivores, but the food i feed him that the breeders have fed him is spike's delite which is a chicken-based hard pellet food. he is the flippin' cutest when he's chewing them up. crunch crunch crunch. you can give them snacks of mealworms, crickets, or worms. you can buy them at pet supply stores or buy freeze dried or canned ones. i bought the freeze dried ones from the breeder and we have to wait a month before introducing new foods into his diet since he should be totally at home before we try to add even more change into his life. Hoggle is such a cutie! I hope there will be lots more pictures to come! omg look at that baby! So cute! holy crap, what a cute little guy. so when do i get to come over and take his picture? hi and hello. anytime you want to and i am around, you are welcome. for awhile there i felt like a pest there calling you a lot to see if you wanted to do something and then i moved and became obsessed with gardening and hedgehogs, so...yes, let's hang out. i'm still dreaming of a band, dude.